Dig into meltingly tender spiced apples with a comforting brown sugar and oat topping in record time. In a unique twist, this recipe uses olive oil in the oat-crisp topping instead of the usual butter. In addition, using the MultiPot Pressure Cooker instead of a conventional oven speeds up the process. You can skip the labor and get straight to the dessert love. The result is a gluten-free dessert that everyone can enjoy. P.S. Don't forget a big scoop of ice cream when you are ready to serve! Use any apple variety you fancy, but always seek out those with firmer flesh to stand up to the cooking process. I like to use a mixture of sweet and tart apples to balance out flavors best, combining half Granny Smith and half Fuji for my crisps. Arrowroot powder is a natural powdered root starch and is used as a thickening agent in this recipe. It is used as a substitute for cornstarch, which is highly processed and difficult to source in non-GMO varieties. Per Serving: 335 calories; 14g fat; 52.0g carbohydrates; 3g protein; 0mg cholesterol; 101mg sodium. I didn't need to know how easy it is to make a really tasty crisp in my pressure cooker. This could be bad, but apples are reasonable good for you, right? Usually, I find people use too much sugar in fruit desserts. This one wasn't that sweet, which was perfect for me. My boys plowed theirs with piles of vanilla ice cream on them after playing soccer in the cold drizzle for a few hours & chased with hot chocolate. Dad of the year! 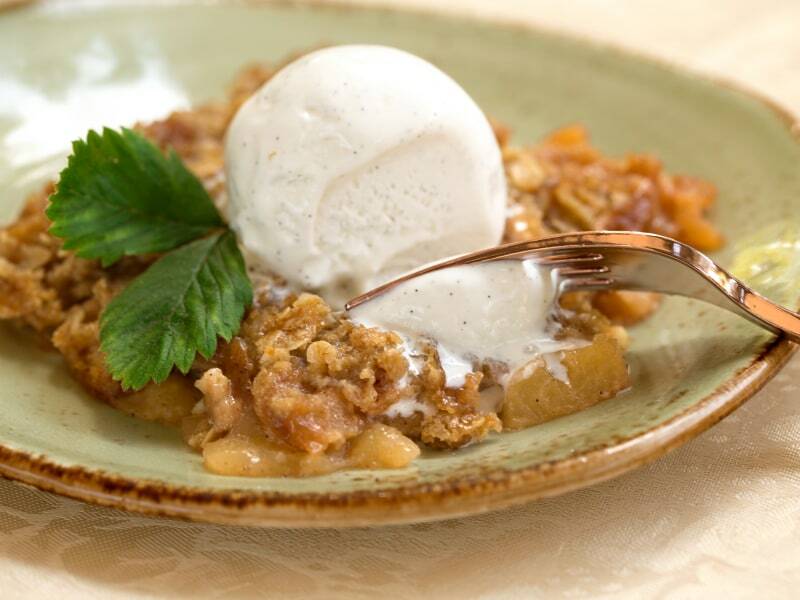 I used Pink Lady apples with Granny Smith, because I like tart apple crisp to pair with vanilla ice cream. On point, and so good. This one's a keeper. I tried a similar recipe last year using the oven, but this is way better! The pressure cooker is a no-hassle way to make this dish. I used Fuji apples, and next time I will either try Granny Smith, or a combination of the two, as recommended. When I saw this recipe I immediately went to the store to get all the ingredients! I used a mixture of Granny Smith, Fuji, and Gala apples. It was so good! I especially love it topped with vanilla ice cream. Such a treat and inexpensive to make. 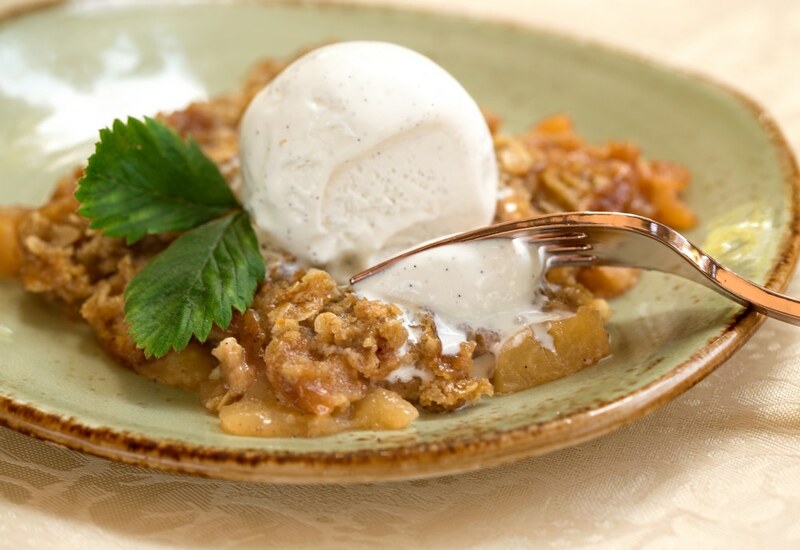 Very good apple crisp recipe, in fact I am making the second batch as I type this review. I made a similar recipe from a different website last year but without the rolled oats and they weren't as good. 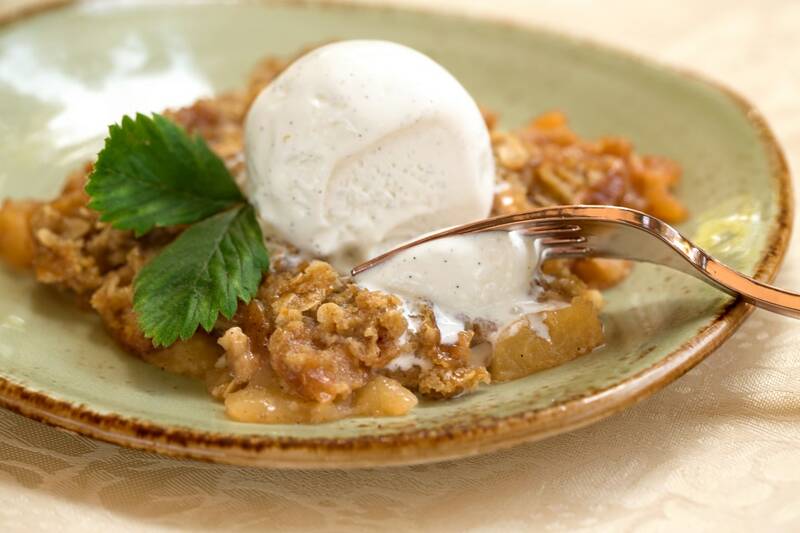 This is the perfect dessert recipe for fall. Bad recipe......can't get away from burn warning. Stopped and put mixture in a conventional over to cook!!!! I also got the "burn" warning. Added more apple juice (1/2 c) and tried to ease the burn up, reset the cooker. Got the "burn" warning again. I am embarrassed to say, I tried again for the 3rd time. Same results. Not willing to give up, cleaned the burn out again, added water and the trivet to the pot and put the apple mixture in a small ceramic dish. Fingers are crossed for success! Is there a step missing here? For example, should I add water to the bottom of the pan first, and then place the apples and crumbs in another pan on top of a trivet? I followed the instructions exactly as stated (apples and crumb mixture added directly to pan and set on pressure cooking for 10 minutes) but the InstantPot gave me a ‘burn’ warning. My guess is this happened because there was no water in the bottom of the pan (no steam/pressure). I get a burn warning as well. Any suggestions? Does anyone have a response to the "burn warning" issue?